Last Sunday night, Mom and I sat in the living room practically melting. By morning, the bagels on the counter had molded. Granted, they were probably well on their way to start with, but the heat in the house didn’t help matters. I had already planned to mow, so why not add the swamp cooler to the list? The answer is yes. A swamp cooler, otherwise known as an evaporative cooler, lowers the house temperature by means of fans and evaporated water. 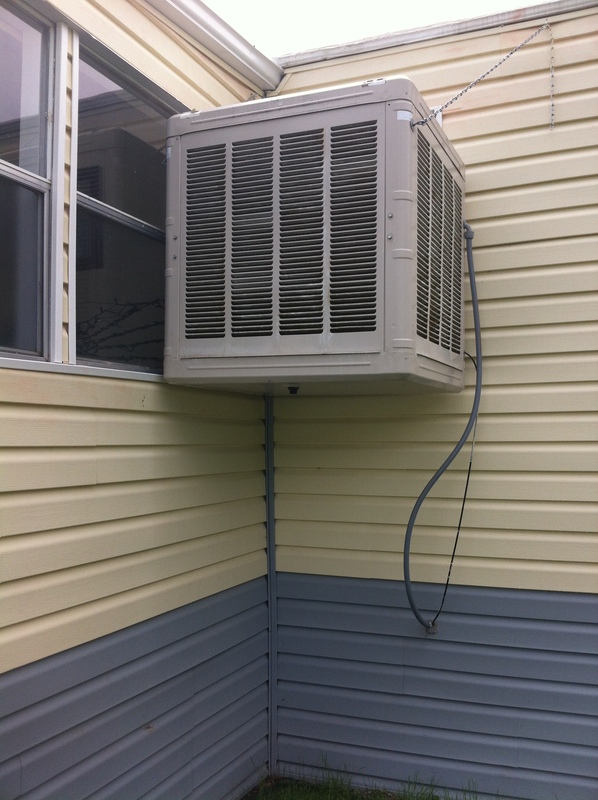 In a place where the humidity is often under 10% an air conditioner just doesn’t always cut it—especially in a mobile home. I knew I needed a ladder, so Sunday night I brought it home from where we store it at the church. (Thinking ahead!) Monday morning, I put my plan into action. But, I hadn’t been out there long, when I realized I had a problem. Two summers ago, Dad and I re-sided the house. It took us 7 weeks and 2 days. Yes, I was counting. Now, I am incredibly grateful for those 51 hotter-than-a-firecracker days. (We put a thermometer out in the sun where we working, and it went up to 115!) Here’s the problem: the new window trim on the deck is set in such a manner that it prevents removing the pad on the left side of the cooler. We took the cooler down for part of the re-siding process. We had to; it was in the way. It took all three of us to get it back up in place, so there’s no way I was going to do that again. From the looks of it, last year, Dad just let it go…one more sign that he wasn’t feeling well long before this happened. If you’ve ever seen the inside of a swamp cooler, you know the pads are fit in metal frames with metal grates over top of them to hold them in place. After about a half hour of trying in vain to get the frame out of the cooler, I realized it wasn’t going to happen. I decided my only option would be to somehow remove the metal grate, set it down in the cooler and then to wiggle the old pad out and a new pad in. My hopes of getting everything done on Monday were growing dim. I measured the pads to know what replacement sizes to get, and then tackled my next problem: Oiling the bearings. How is it, that I live in a state where MANY people use swamp coolers, but none of the people I know who use them know how to set them up? Perhaps it’s because…my dad always did it for them. I knew something needed to be oiled, but I didn’t know what or where. An information sheet I found on the internet said to put the oil in the “oil receptacle.” Yeah, I didn’t see anything that looked like a “receptacle.” Again, after about a half hour, I Googled it. No wonder I couldn’t find it! The two spots are almost microscopic! But, with that done, I now knew everything I needed to know to go to Lowes and get parts…which, with a few other errands added in, took another 2 hours. My plan to wiggle the pad in worked! It took quite a long time, but eventually, I got it in there. The other two pads were a breeze. Oiling the bearings—easy as pie. Then came the part I’d been dreading. 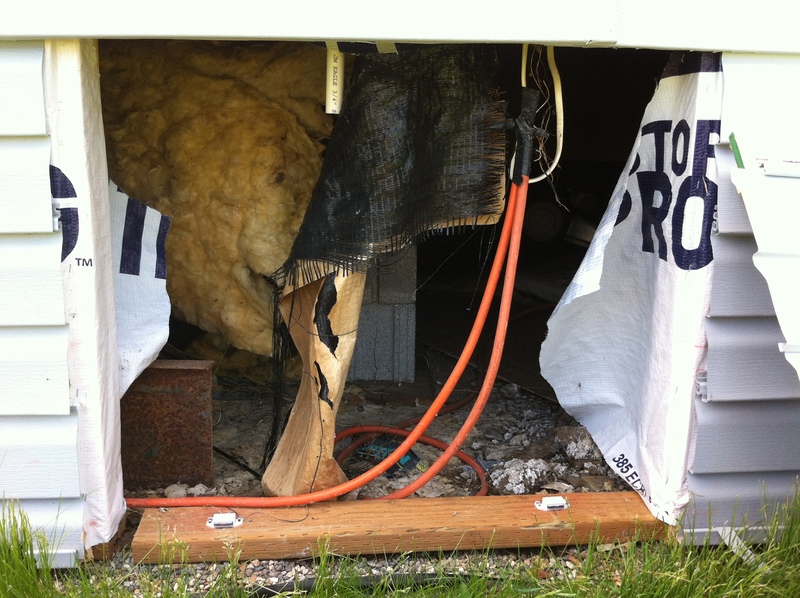 While we were suffocating in the house the night before, I’d tried to turn the cooler’s fan on, just to move some air. When I hit the switch, however, the world remained silent. If you know anything about swamp coolers, you know silence is not their strong point. So, now that the pads were changed and the bearings oiled, I needed to find two things: the power source and the water source. Both appeared to be under the house. I’m not a large person, yet, but I was very aware of the cramped space as I crawled in through spider webs and dangling insulation and wires. In the end, I realized I wouldn’t have actually had to crawl in, if I had known what I was doing. The power source was not under there, and the water source was right inside the access panel. But, while I was under there, I realized how difficult it must have been for my dad all those years he worked under there on various wiring, plumbing and phone projects. I could manage to get up on my hands and knees and turn around. But at 6’2” and well over 200 lbs, he would have had to belly crawl in and belly crawl out—backwards. After much fidgeting and poking around and investigating, I discovered the system was shut off, of all places, at the thermostat. Makes sense, I just forgot about the thermostat. It wasn’t until I was texting my sister, asking her to pray that I find the power source, that I thought of it. Then, with the flip of the switch we were up and running—what a beautiful sound that was. With God’s help we can take on tasks we never thought we’d be doing. Sometimes working on those tasks, the things are father/husband would have done, can be painful. Throughout the process, especially the first time, we are keenly aware of WHY we are doing it. Talk to God throughout the process, keep your eyes on Him—that is where we must be to experience His peace. Pray about it. Sometimes when we get stuck on a project we’re tempted to just force our way through it. Don’t. That will only increase your frustration. Stop, take a deep breath, and pray. Ask the Lord to guide you with His eye, to give you understanding of how things works, wisdom as to what steps to take, and the strength to take them. Sometimes we have to go into the dark to really appreciate someone. My dad was an amazing man. He could fix almost anything. In fact, we fixed pretty much everything together. I don’t mean that I helped him with all the house repairs. I mean when I had a problem, a question, an idea, a computer issue—whatever the situation—Dad and I worked through it together. I’ve always appreciated that about him, but as I crawled through that tight, dirty, spider-infested space I realized a little deeper how much he was willing to put himself through to provide for and protect his family. Take time in the darkness to remind yourself of the amazing man God put in your life. Write some of those things down. Thank God for them—for him. Be aware. Many people will say, “If you need anything just call me.” This puts the burden back on the family that is already carrying an amazing burden. They know the offer is sincere, but they also know the person making it is just as busy as everyone else. They know they are working or ministering, and won’t want to disrupt their lives. The needs do not stop the day after the funeral, but many of the calls and offers to help do. Stop by and offer to walk around the house to see if anything needs to be repaired. Are they dealing with leaky sinks, doors that won’t latch, dishwashers that won’t wash, etc? Find out what needs to be done and then present the needs to those who are able and willing to help. Consider the others affected. As mentioned above, my dad set up swamp coolers for others. He also fixed plumbing problems, carpentry problems, computer problems, etc. for the widows in our church and did a great deal of house repair for our single missionary lady. These women have also now lost a great deal. Sit down with the family and find out who their father was helping and serving. Make sure the others whose lives he was touching have not been forgotten. The insights shared for churches have to be carried out for individuals. Ask the Lord to help you know how you can help, to give you a willing heart, to help you see the investment of your time in their lives as a valuable investment for eternity. Are you from a fatherless family? How have others stepped up and helped in time of need? Or have you found yourself struggling through with little help? What are/were some of your biggest needs? Are you a pastor or church leader? How has your church sought to meet these types of needs, or how do you plan to do it in the future? Are you an individual? What ways have you found to help fatherless families in their time of need? Please, share in the comments below.